Time to clean the human flesh...we mean plaque...from that lizard's teeth. 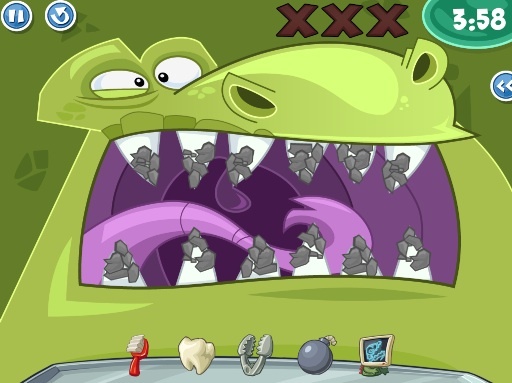 If you dream of being a dentist, or at the very least, enjoy quirky iPhone and iPad games, Monster Mouth DDS comes recommended. 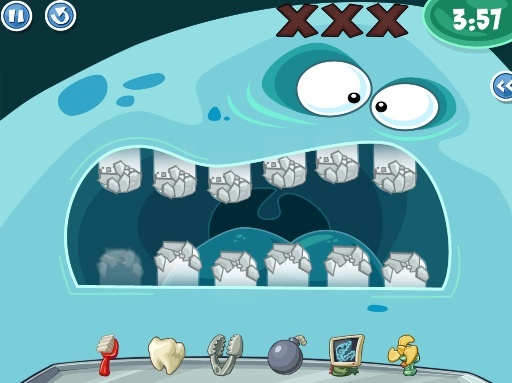 Breaktime Studios' surgery game lets you stick your hand inside ten monsters' mouths, where the goal is to scrape plaque off their teeth and yank cavities while keeping a close eye on the constantly ticking clock (if the timer reaches zero, it's game over) and avoiding mistakes; you have up to three strikes per level. Each operation comes with a handful of tools necessary to get this dirty job done, like toothbrushes, pliers and dental caps, along with more over the top items, including x-ray equipment for locating cracks, a suction machine for collecting water and even bombs. Everything's touch based, so you'll rub the brush with a finger, tap cracked teeth to blow them up and press and drag to extract those cavities. Then, after completing the procedure, the game displays the number of points scored and gold stars earned. From there, you can post your greatest accomplishments to leaderboards via OpenFeint and/or Game Center. That said, the free download comes with three monsters, with an optional in-app purchase of $0.99 to unlock the rest. Is Monster Dash worth the dough? Sure, but you'll see everything the game has to offer in roughly an hour. It's up to you to decide if the money's worth it. Although Monster Mouth DDS could use more content, it's still a well-designed title and a fun way to pass the time, especially for kids. What's Hot: Ten unique monsters, free to download, Game Center and OpenFeint support, easy to learn controls, universal. What's Not: You can beat it in an hour, too easy.